31 research institutes are involved in the HALO project. 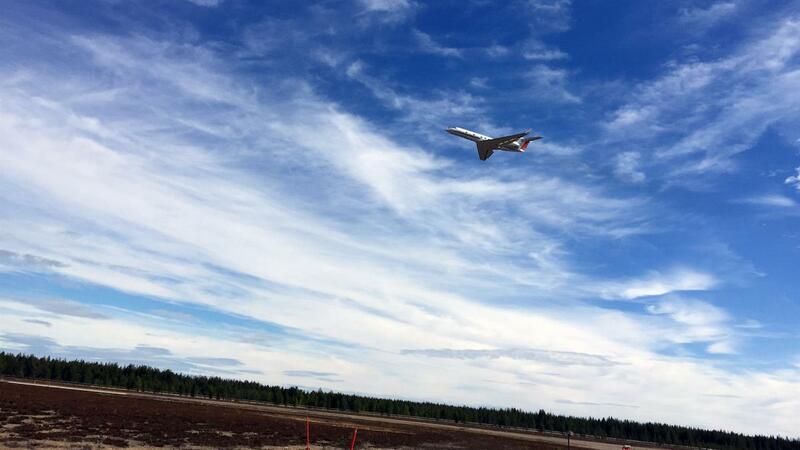 HALO flies during a research flight on 28 May 2018 over the area of Sodankylä in Finland conducting measurements on ground stations, balloon probes and satellite overflights as part of the CoMet mission. 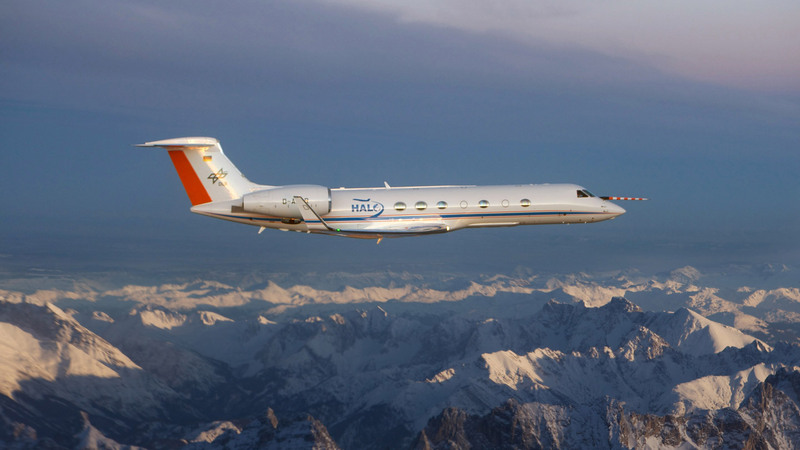 The HALO (High Altitude and LOng Range) research aircraft is based on the ultra-long-range G 550 business jet produced by Gulfstream Aerospace. With a range of more than 8000 kilometres, measurements on the scale of continents are possible; the research aircraft can reach all regions, from the poles to the tropics and remote areas of the Pacific Ocean. Its maximum flight altitude of about 15 kilometres also allows for measurements in the lower stratosphere, outside the tropics. 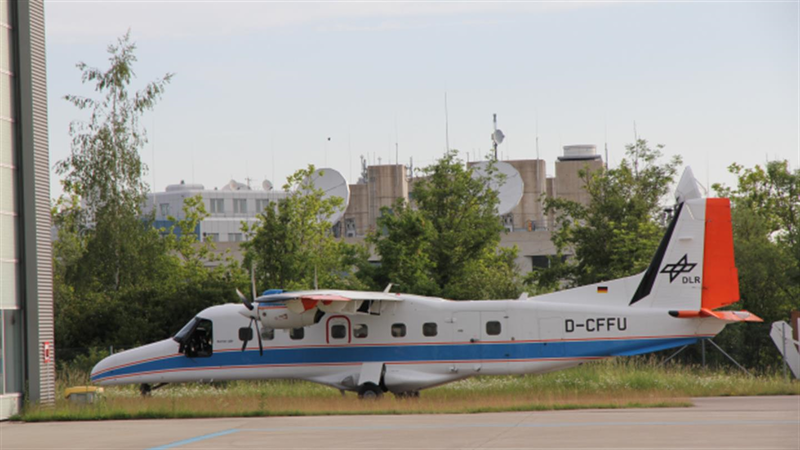 The DLR Do-228 D-CFFU carries spectrometers and radar instruments for Earth observation. 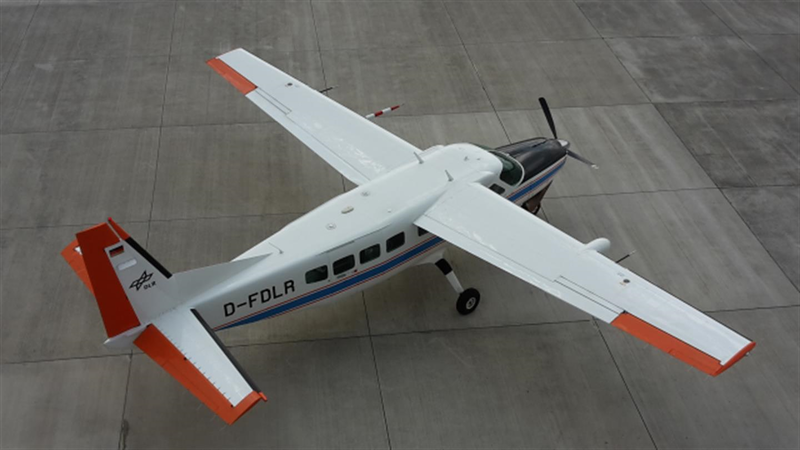 The DLR Cessna Grand Caravan D FDLR carries various instruments for atmospheric research and Earth observation. In addition, it is regularly used as a ‘flying auditorium’. In this image, the aircraft is parked at its home base in Oberpfaffenhofen. Data is being acquired over the whole of Europe and as far away as North Africa. Using independent measurements to obtain detailed understanding of the sources and sinks of greenhouse gases. Methane emissions may originate from coal production, the oil and natural gas industry, landfill sites, livestock farming or rice cultivation. In addition, there are also natural sources such as wetlands and permafrost. Effective monitoring of greenhouse gases is required to achieve ambitious targets for limiting greenhouse gas emissions. In addition, the sources and sinks of greenhouse gases must be understood as precisely as possible to produce reliable climate forecasts. From mid-May to mid-June 2018, a flight test campaign led by the German Aerospace Center (Deutsches Zentrum für Luft- und Raumfahrt; DLR) is contributing to this international effort. The High Altitude and Long Range Research Aircraft (HALO) is concentrating on the two most important anthropogenic greenhouse gases – carbon dioxide (CO2) and methane (CH4). It is testing innovative instruments for measuring greenhouse gas concentrations; data is being acquired over the whole of Europe and as far away as North Africa. A Cessna owned by DLR and another owned by the Free University of Berlin (Freie Universität Berlin; FUB), each equipped with high-precision instruments from the University of Bremen, are also being used in the 'Carbon dioxide and methane mission for HALO (CoMet) mission. In addition DLR's Dornier Do 228-212 (D CFFU) and a Falcon 20 research aircraft operated by the mission's French partners, the national facility for airborne research (Service des avions français instrumentés pour la recherche en environnement; SAFIRE), the National Center for Scientific Research (Centre national de la recherche scientifique; CNRS) and the national space agency (Centre national d'études spatiales; CNES) are participating in the campaign. Flights are taking place over Berlin, the coal-mining region of Lusatia on the German-Polish border and the mining regions of Poland, among other locations. “At least 63 flight hours are planned for the HALO missions over European urban areas, ground-based monitoring stations and coal mines by mid-June,” says project leader Andreas Fix from the DLR Institute of Atmospheric Physics. The three smaller aircraft will contribute an additional 80 flight hours. The HALO research aircraft is equipped with a total of seven instruments for the detection of greenhouse gases and measurement of other meteorological parameters, as well as to collect air samples. "We want to obtain a detailed understanding of the sources and sinks of greenhouse gases using independent measurements. Methane emissions may originate from coal production, the oil and natural gas industry, landfill sites, livestock farming or rice cultivation. In addition, there are also natural sources such as wetlands and permafrost," continues Fix. "In order to quantify the influences of anthropogenic methane on climate change, both the man-made and natural sources of the gas must be investigated and the underlying processes understood." At present, there is a major dearth of research in this area. 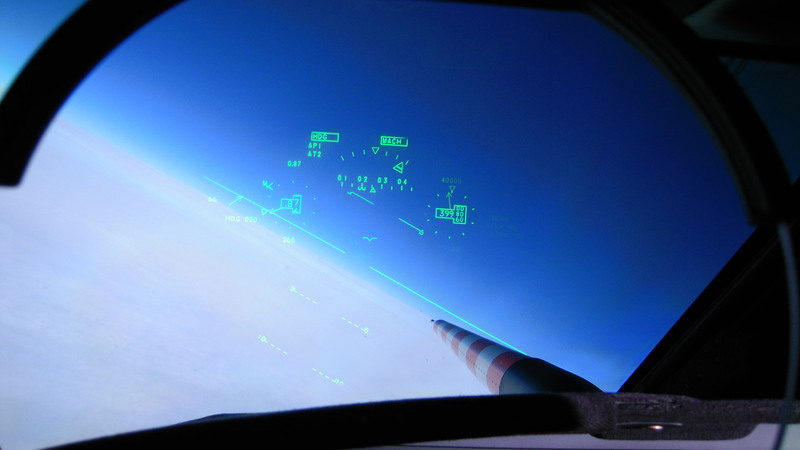 "Carrying out these kinds of missions, especially in the busy airspace over Europe, requires a lot of coordination with the various air traffic controllers in the countries that we fly over," says research pilot Marc Puskeiler. "Agreements have to be made with air traffic control several days in advance. This places heavy demands on weather forecasting and flight planning, because the researchers need cloud-free measurement conditions as far as possible," adds Frank Probst of the DLR Flight Experiments facility, which is managing the operation of the DLR aircraft during the CoMet mission. While HALO is primarily conducting measurements at altitudes of up to 15 kilometres, the two Cessna aircraft from DLR and FUB are investigating the distribution of greenhouse gases in the lower part of the atmosphere, up to an altitude of three kilometres. In doing so, they sometimes spiral upwards in order to obtain measurements at the planned maximum altitude. The joint HALO flights with the Cessna aircraft are focussing on two areas that are particularly interesting from a scientific perspective. The first is the Upper Silesian coal-mining area, which is one of Europe’s largest sources of methane due to the mine gases emitted by the many anthracite mines. The second is the Berlin area, which is interesting by virtue of its 'island status', surrounded as it is by sparsely populated regions, which makes it a good location for researching the greenhouse gas flows from a major city. The project is supported by Polish partners from AGH University (Akademia Górniczo-Hutnicza) in Kraków. During an experimental flight to Poland, a fourth aircraft, the DLR Do-228, will take part in the CoMet mission. It is equipped with a hyperspectral sensor. The researchers are testing whether this remote-sensing instrument, which is usually used for imaging Earth’s surface, is also capable of visualising strong sources of methane. Carbon dioxide is widely known to be the most important greenhouse gas in the atmosphere caused by human activities. "What is less well known is that despite the fact that its concentration in the atmosphere is 200 times lower than that of carbon dioxide, methane also has a major impact as a greenhouse gas. According to a report by the Intergovernmental Panel on Climate Change in 2013, over the first 20 years, the climatic effect of an emitted methane molecule is 86 times greater than that of a carbon dioxide molecule. At 100 years, this figure reduces to a 28-fold climate impact, which is still considerable, because methane breaks down faster in the atmosphere," explains Fix. Overall, the share of global warming caused by carbon dioxide has been approximately 65 percent since the beginning of the Industrial Revolution, while methane makes up around 18 percent of all anthropogenic greenhouse gases. "Since 1750, the concentration of methane in the atmosphere has more than doubled, while carbon dioxide has increased by around 44 percent over the same period," adds Fix. "A better understanding of methane concentrations in the atmosphere and strategies for reducing future methane emissions could make a significant contribution towards achieving the two-degree target." The CoMet mission, initiated by DLR, the Max Planck Institute for Biogeochemistry and the Universities of Bremen and Heidelberg, will be the first to include, among other instruments, the CHARM-F (CH4 Atmospheric Remote Monitoring) lidar measuring device, which offers high-resolution methane detection. “The new technology allows us to measure methane and carbon dioxide concentrations from a great distance, regardless of the amount of sunlight, and with a high accuracy," explains Fix. Beginning in 2023, a similar instrument will monitor regional and global emissions of methane from space, on board the Franco-German 'Methane Remote Sensing Lidar Mission' (MERLIN) satellite. This will be an ideal complement to the Copernicus Sentinel 5P (precursor) and Sentinel 5 missions. The French Falcon 20 research aircraft will take part in one of the measurement flights to test the MERLIN technology. It carries a built in greenhouse gas instrument for taking comparative measurements while researchers on board HALO are testing the lidar technology that will later be used for MERLIN. The joint measurement flight is coordinated with ground stations and balloon ascents, and requires clear skies over most of France. The HALO research aircraft is a joint initiative of German environmental and climate research institutions. HALO was procured with funds provided by the German Federal Ministry of Education and Research (BMBF), the Helmholtz Association and the Max Planck Society (Max-Planck-Gesellschaft; MPG). HALO is operated by the German Research Foundation (DFG), the Max Planck Society (MPG), the Jülich Research Center (Forschungszentrum Jülich; FZJ), Karlsruhe Institute of Technology (KIT), the German Research Centre for Geosciences (Deutsches GeoForschungsZentrum; GFZ) in Potsdam and the Leibniz Institute for Tropospheric Research in Leipzig (TROPOS). DLR both owns and operates the aircraft.